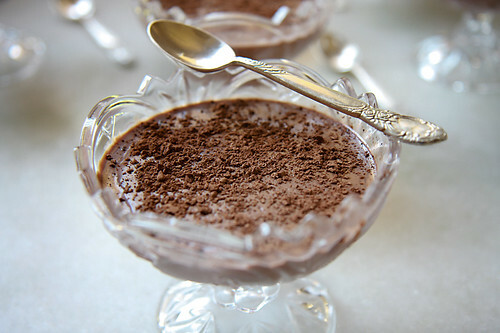 My aunt Anita makes an awesome chocolate pudding. Every summer during our annual school vacation we visited our grandparents in Bangalore. A visit to Anithatte’s house was always on the cards too and more often than not we would be greeted with this wonderful chocolate concoction after a sumptuous lunch. 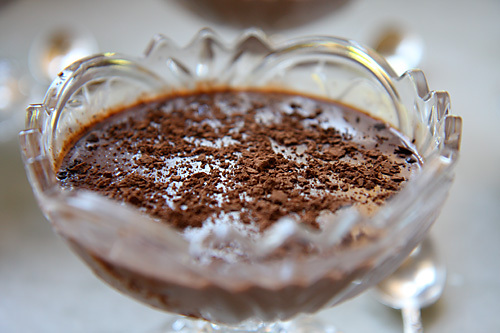 When I saw this recipe online and translated it into English using the google translator, I was immediately transported into my childhood and vivid memories of sitting with a bowl of “chocolate delight” with my cousin Amrita formed in my mind. I looked through my recipe files since I remembered having jotted down this recipe when I visted Anithatte for lunch, some years ago, and found a page, yellow at the edges, mellow with age. My aunt’s recipe was a tad more tedious than the online version and involved cooking the chocolate milk mixture over a double boiler. I was pleasantly surprised to note that this international version had no eggs which made it acceptable to my style of cooking. This makes for such a wonderful dessert. And who doesnt like chocolate? The ingredients are few and can be easily found in most homes. And it is also easy to put together. When I made this for my family, I had everyone asking for seconds and each bowl was scraped clean. With a little planning and preparation, this simple dessert is sure to win the hearts of those who try it. Adapted from food & cook. You can vary the milk and cream ratio in this recipe. Use 50% milk and 50% cream for a creamier version. This recipe is adapted from here. In a saucepan, mix the milk and cream together. Take 1/2 a cup of this mixture in a small bowl and mix in the sugar, cornflour and cocoa powder to make a smooth paste and keep aside. Heat the remaining milk in the saucepan over a medium flame. When it comes to a boil, lower the flame and stir in the cocoa/cornflour/milk mixture and cook until thick and creamy. Stir in the vanilla extract. Pour into ramekin bowls or cups. When the custard comes to room temperature or cools down, chill in the refrigerator for atleast 3 hours before serving. Sprinkle with cocoa powder before serving. Gorgeous pictures as ever! So Yummy!!!!! This sounds so easy, gorgeous clicks! That looks wonderful. Am surely going to try it. I just made this. It tastes great and is so easy to make! There was no mention of when to add the sugar so I threw it in along with the cornflour/cocoa/milk mixture. I can definitely see why people were asking for seconds. It looks amazing. I'm sure everyone will enjoy making, eating and serving this dessert. 🙂 Its sheer joy! Anjali: Thank you for pointing out the omitted step. I have made the required addition. I'm glad you liked this custard. ummm!chocolate always catches my attention – and this? i want one! looks divine! Oh so awesome as ever. Tanya is going to love this…. Yum! Preethi: I'm sure tanya will love this. 🙂 Let me know the details. I'm always surprised when someone can turn something eggless or gluten-free or whatever and still have it look and taste perfect and rich and gooey and yummy! 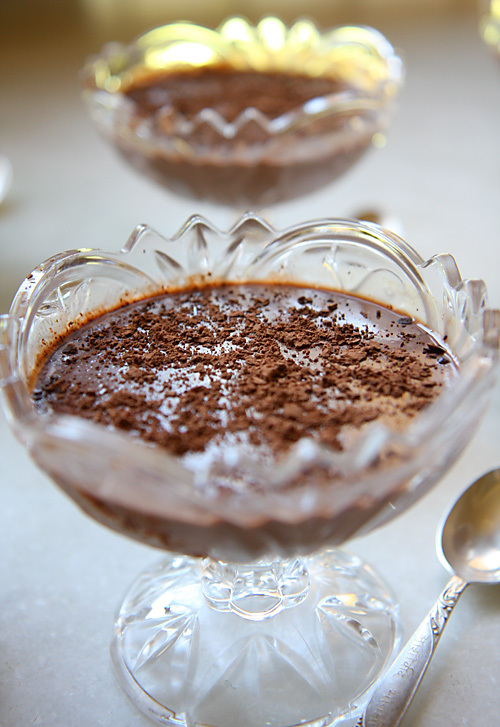 This chocolate pudding looks too fabulous and delicious! And I'm amazed it was done with no eggs! Beautiful pudding! so yummy and easy… I really want to try this!! I love your blog and tried few recipes n they turned out awesome. But I tried to make this pudding over the weekend and it didnt work out. I left it in the fridge for 24 hrs, but it still didnt set. The only thing that I did different was I added a spoon of brown sugar as I ran out of white sugar. Would that have been the reason? Pallavi: I'm glad you like divinetaste. This pudding is a soft set pudding. I havent tried this with brown sugar but since brown sugar is more acidic than white it could alter the texture. I can't give you an exact answer since I have not tried this with brown sugar. Try it with white sugar and if the problem persists do let me know. Thanks. I met your sister on a train yesterday and she told me all about your blog. I'm really excited to have found such a wealth of delicious recipes. This one looks so good, I can't wait to try it! CK: How exciting to meet you! Dhanu: I'm glad you enjoyed this. Thank you for reporting your success in making it. I have always loved custards from my childhood , but i always go for the custard mix in the stores. This was just so simple and easy to make , loved it. Wonderful blog and beautiful pictures !!!!!!!! Nivedita: Thank you. I'm glad you liked this simple yet decadent dessert. Pratiba: Hey I'm glad this worked for you. It is simple to make and is a winner always! I tried this one 🙂 It turned out to be amazing,more than my expectation.It tastes exactly like my favorite chocolate mousse of sweet chariot. Hi, This recipe looks yummy and simple. I plan to make this 24 hours before the party. Will the custard still keep or will it become too thick? Vidhya: You can make it a day in advance. The custard will remain the same so don't worry! Hi Anushruti… I tried this yummy dessert from ur blog and it was just too yummy. Thanks for a fab recipe. You have an amazing space. Varsha: So happy you enjoyed it. Hi! 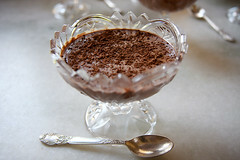 i was looking for a chocolate pudding recipe online yesterday and came across your blog. the pictures looked divine! and the recipe looked simple so gave it a go. it turned out amazing, can't wait for hubby to try some 🙂 next time will try with strawberries! thanks for this gorgeous recipe, it is def going in my recipe book! Sarah: Glad this worked for you. Happy cooking! Tried this quick and easy recipe. Everyone enjoyed and appreciated the dish. Shruti: Yes you are right…this is so quick, easy and truly enjoyable! Sahana: So glad to be of help to you! Hope your guests enjoyed it too. 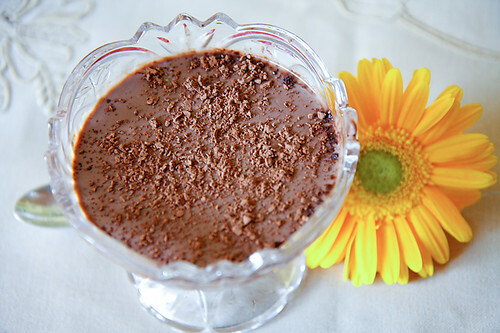 Thank you for such a wonderful recipe,,,i have some vegetarian guests coming over this thursday..and iam going to present them with choco pudding for dessert..iam sure they are going to love it !!! I have been looking for something just like this for my cherry choclate trifle,instead of the traditional one we always have for christmas day, my mouth watering as i tipe. it says 1/2 cup of the milk and cream is taken. what is done with the left half? Tanya: You heat the remaining half and proceed as per the recipe. Tried this today and it was so delicious. Thank you for the wonderful recipe. That looks absolutely yummy, and v simple too! Have you used sweetened cocoa powder or the unsweetened one? Poonam: I think you can. I usually make it with cornflour. It was so delicious. I'll want to tried again. Do we have to take boiled milk or unboiled milk to mix with fresh cream?? Hi Anushruti..the other day I made chocolate cake using ur recipe..there was some chocolate icing left so I coated some small glasses wid it n left it in the fridge..even forgot about it..after a few days I made vanilla custard n suddenly remembered about the chocolate lined glasses..so I filled it up wid the hot custard..my sister just happened to be hovering around n she whisked d glass away..after having a spoon full she just didn't stop n so did my brother in law..the chocolate icing n hot custard recipe became an instant hit wid my family..so I thougth it would only be fair to thank you as well..the chocolate icing is versatile n can be used warm or cold both..tried !! Tested!! N happy !! Hi Anushruti, tried this pudding. It was easy to make and absolutely delicious. It was a huge hit with the guests. Thanks for another awesome recipe. I was wondering whether this pudding can be used as a filling between cakes and if so are there any changes that I need to make? Also tried your butterscotch pudding and vanilla bean pudding . Both were successful. Can the butterscotch pudding be made without agar agar? I still have problems using agar agar. It is a hit sometimes and a miss sometimes. It would be really helpful if you could post a tutorial on how to use agar agar in vegetarian desserts and cheesecakes. Hi Anushruti, another fabulous and hit recipe from you. It was very easy to make and was a huge hit with the guests. I was wondering whether this pudding can be used as a filling between cakes and if so what are the changes that you would recommend? Also tried your butterscotch pudding and vanilla bean pudding. Both came out well. Though am still not confident about agar agar based desserts. They sometimes are a hit and sometimes a miss. It would be really helpful if you could post a tutorial on how to use agar agar in vegetarian desserts and cheesecakes. Can the butterscotch pudding be made without agar agar? Also can the butterscotch and vanilla bean pudding be used as a filling between cakes? Pooja- That's a great idea. Thanks for sharing! Himani- You can serve this custard alongside a cake but I'm not sure if this can be used for filling or icing the cake. Will try and post a butterscotch pudding with cornflour soon. For tips to use agar agar, read my mango cheesecake post. My fiancé made this as a surprise dessert for me. He is someone who never steps foot into the kitchen, let alone cook! Needless to say I was really touched and of course it turned out to be really nice. A must try recipe for sure. Piya- Boiled is always better. Sivani: Thank you so much for the feedback! It's really wonderful for your fiance to have created such good memories for you.